St. Augustine History Museum Proudly Presents…. In the year 1513, Juan Ponce de Leon left Spain in search of The Fountain of Youth. Legend reveals that anyone who was to drink from the fountain would stay young forever. Ponce de Leon left Spain with expectations of discoveringthe fountain in Bimini, an island located in the Bahamas. 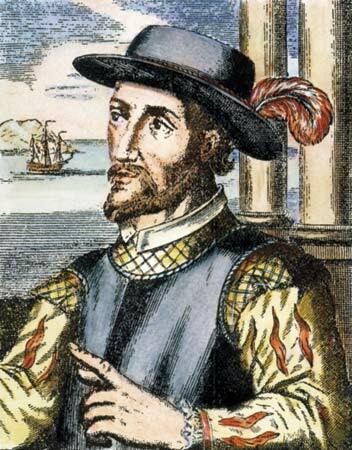 Ponce de Leon’s strength of mind directed him to deem a piece of North America an island (la Florida), and claimed the land in the name of his King, the King of Spain. Ponce de Leon was the first European to explore Florida. St. Augustine, Florida is rich in Spanish history, and is honored to have the opportunity to showcase many unique exhibits, specifically intended to educate the general public on St. Augustine’s extensive past. Archaeologist Raphael A. Cosme has been researching and investigating Spanish colonial artifacts for the last 25 years. Cosme’s discoveries have been identified as the best archaeological findings of all time in the Caribbean. Now the “Treasures of Juan Ponce de Leon” will be accessible for public viewing. Cosme’s findings include a comb carved out of bone, buttons, glass, coins dating from 1500 to 1630, cattle bones, and plenty of other inimitable pieces. What makes this exhibit truly fascinating is the fact that the site location of excavation could be the land boundary of Ponce de Leon’s temporary wooden house, which was built between 1519 and 1521. The exhibit is a must see St. Augustine attraction to complete one’s vacation here in the city of St. Augustine. Posted in St. Augustine | Comments Off on St. Augustine History Museum Proudly Presents…. 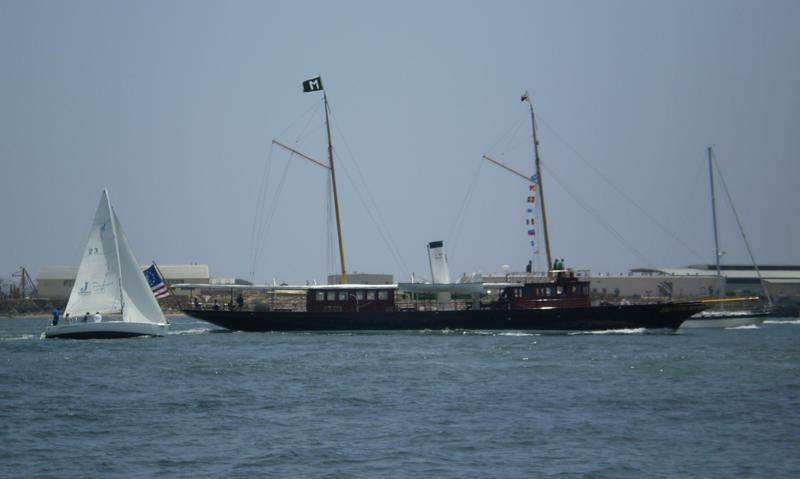 Visitors along San Diego Bay got a rare look at steam-powered yachts, the graceful boats built early last century that ruled the waves in the age before diesel engines. 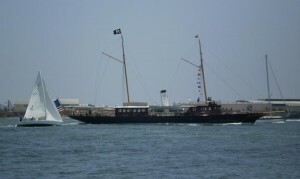 The Maritime Museum of San Diego’s steam yacht, Medea, and the visiting 126-foot-long steam yacht, Cangarda, raced on San Diego Bay. 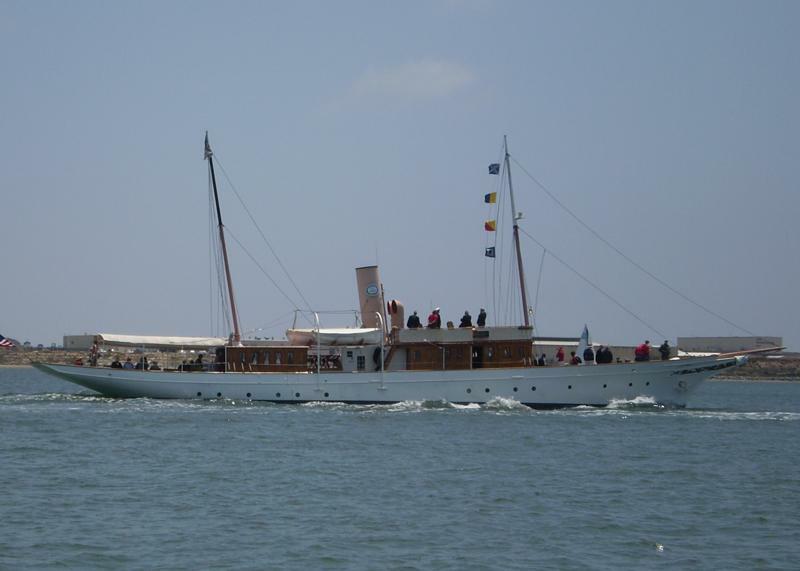 This marked the first time two of the world’s only three remaining operational steam yachts from the 1901-1910 Edwardian era met to race. 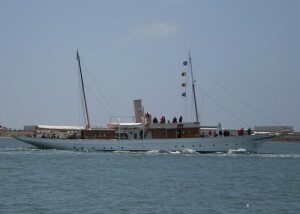 These elegant steam yachts are rare since many were used as warships during World War I and were lost during anti-submarine efforts. Then the advent of diesel engines for yachts began. Nancy Bartlett is the HTA Goalie of the Year! 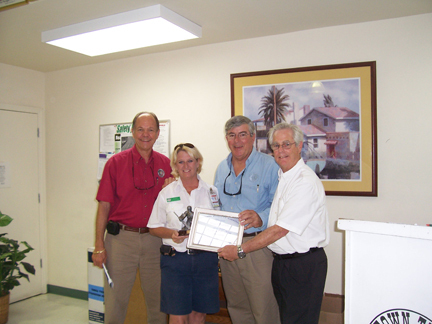 Last night in Key West Bobby Bernreuter, National Sales Manager for Historic Tours of America, presented to Nancy Bartlett, Head Sales Representative of Old Town Trolley Tours of Key West the HTA Goalie of the Year Award. Nancy was commended for her leadership abilities which inspired the Trolley Sales Team to achieve 122% of their annual sales goals. Our HTA top sales reps for busting goals are Washington DC’s Tom Austin who achieved a whopping 187% of his annual goal, followed by Matt Tielkemeier of OTT Key West at 149%, and Teresa Hanke of the Conch Tour Train at 133%. The following are the top reps from the remaining operations: Calvin Thomas at 131%, Savannah tours; Barbie Harrell at 126%, San Diego tours; John King at 115%, Boston tours; and Kathleen Helland at 110%, St. Augustine tours. Posted in Boston, Key West, San Diego, Savannah, St. Augustine, Washington DC | Comments Off on Nancy Bartlett is the HTA Goalie of the Year! The first Mother’s Day Proclamation was made by Julia Ward How in 1870. It most likely was a reaction horrendous losses suffered in the American Civil War and the Franco Prussian War in Europe and tied into her very strong pacifist beliefs. Many attempts were made to establish a Mother’s Day, but it wasn’t until 1908 that Anna Jarvis of West Virginia did so to honor one’s mother, which had been a dream of her own mother. After much lobbying to President Woodrow Wilson made it a national holiday in 1914. Today, Mother’s Day is celebrated all over the world at different times of the year, but 77 countries, including the US and Canada, celebrate Mother’s Day on the second Sunday in May. So in honor of Mother’s Day 2010, Old Town Trolley Tours of Washington, Boston and St. Augustine will be presenting mother who ride the tour with carnations. In Key West all moms will get a free ice cream cone from Mattheessens Ice Cream Parlor. On Savannah tours, moms will get a delicious ice cream cone from Leopold’s and in San Diego, from Cold Stone Creamery. So from all of us at Old Town Trolley Tours, Happy Mother’s Day! You are currently browsing the Old Town Trolley Tours Blog blog archives for May, 2010.